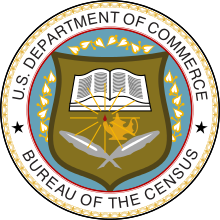 The Eighteenth United States Census, conducted by the Census Bureau, determined the resident population of the United States to be 179,323,175, an increase of 18.5 percent over the 151,325,798 persons enumerated during the 1950 Census. This was the first census in which all states recorded a population of over 200,000. Microdata from the 1960 census are freely available through the Integrated Public Use Microdata Series. Aggregate data for small areas, together with electronic boundary files, can be downloaded from the National Historical Geographic Information System. Personally identifiable information will be available in 2032. ^ PIO, US Census Bureau, Census History Staff,. "The "72-Year Rule" - History - U.S. Census Bureau". www.census.gov. Retrieved October 26, 2015.